When it comes to marathons, heat, sweat and miles of running are often the images that come to mind. For athletic types, this might seem like a good time, but for others, it’s distressing and daunting. Yet not all marathons are the same, and “themed runs” are taking these events to a new level. Now, it’s not only about making it to the finish line, but it’s also about dodging bloody zombies, squeezing in between bubbles, swimming in mud and being drenched in colorful paint. Although it sounds odd, bubbles, foam, mud and even zombies have become the standard for runs that trigger our artsy side. These emerging themed runs are taking over, offering different, trendy options for people of all ages and preferences. Fall in Miami is the prime time to be a marathoner, whether you’re a regular or trying it out for the first time. There are a ton of fun races to attend; Foam Glow, Zombie Rush, Bubble Run and Color Run are just some of the options. September kicks off with Bubble Run, a frothy 5K complete with foam cannons, colored bubble bogs and a mysterious bubble tree that animates the course. Open to runners of all experience levels, the race enforces only two rules: wear white clothing and be a kid again. The Bubble Run begins at 9 a.m. on Sept. 26 at Homestead-Miami Speedway. Tickets are $50 and kids under the age of six race for free. The more frothy you get, the better. For those looking to put a twist on this year’s Halloween, Zombie Rush is the ideal event. Runners must cross the quarantine area and make it to the safe zone all while being chased by zombies – it’s straight out of a “Walking Dead” fan’s dream. With movie-like scenarios, terrific makeup effects and perfectly tailored costumes, Zombie Rush is a once-in-a-lifetime opportunity to either test your survival skills or ace Zombie 101, since the race is open to runners and zombie volunteers. The race takes place in October and offers both daytime and nighttime runs. The ultimate fan favorite happens in November with the Color Run, which combines music, exercise, art and fun. Whether you go with a team or fly solo, the race is designed for anyone who wants to celebrate health, happiness and individuality. 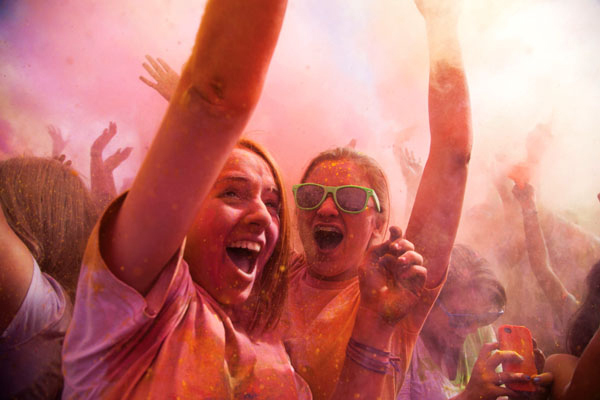 Also known as the Happiest 5K on the Planet, Color Run is the original paint race and the only one where paint splattering another person is completely acceptable. This year’s Shine Tour takes place Nov. 14 at Sun Life Stadium and is designed to uplift and inspire runners to stand out from the crowd and sweat sparkles. There will be sparkle attractions on the course, glamorous photo opportunities and new shine elements at the Finish Festival. The cost is $45 for individual runners, and groups pay $40 per person. Springtime will bring additional options, like the Down & Dirty obstacle race in May and the Foam Glow 5K in June, where paint splattering is upgraded to gleaming neon colors and black lights.